Cover: First Long Island Rail Road train from Penn Station to arrive at Patchogue, September 8, 1910. Courtesy of the Queens Borough Public Library, Long Island Division, Howard Conklin Collection. transportation, but often by the aggressive marketing of new transportation technologies as well. Nineteenth century Long Island was predominantly rural. Agriculture and maritime activities, the two main areas of employment, sustained Long Island’s small towns and villages. With the exception of a significant sand mining industry and a number of large hotels along the shores, there was little development to speak of. Yet, by the latter part of the twentieth century, Long Island was home to a population of 6.8 million and the nation’s busiest commuter railroad. Furthermore, it acquired a reputation as the quintessential American suburb. The idea of a resort industry had originally evolved under Colonel Thomas R. Sharp, the Long Island railroad’s receiver and president from October 1877 to December 1880. Forced to deal with the financial problems bequeathed by the Charlick and Poppenhusen administrations, Colonel Sharp attempted to increase both freight and passenger revenue. At the time, the railroad owed a total of $14,190,000 in debt and loans. On the freight side, Sharp offered discounted rates and special trains to Long Island farmers and fishermen. These special freight trains would stop on request between stations in order to load produce. In addition, the return transport of produce containers was free. Rockaway Beach during the summer nights of 1878 and 1879. Colonel Sharp purchased state of the art Pullman cars for Rockaway Beach and insisted that they be drawn by the newest locomotives, which were faster and less smoky. Finally, Sharp provided extra service during popular vacation weekends. The Manhattan Beach Hotel, 1902. Courtesy of the Queens Borough Public Library, Long Island Division, Rugen Collection. The LIRR Ferry Terminal at Long Island City. Photo by Hal Fullerton. Courtesy of the of the Queens Borough Public Library, Long Island Division, Hal B. Fullerton Collection. 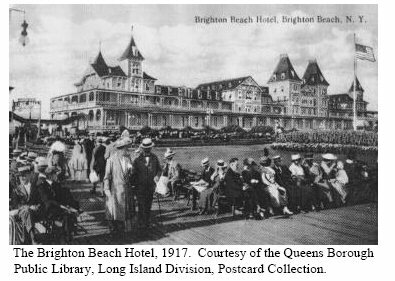 The Brighton Beach Hotel, 1917. Courtesy of the Queens Borough, Public Library, Long Island Division, Postcard Collection. 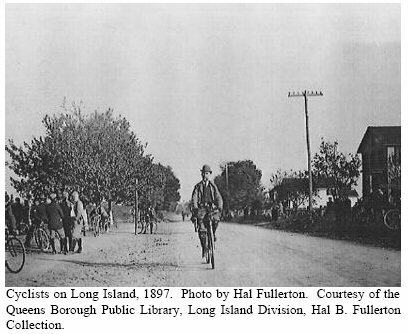 Cyclists on Long Island, 1897. Photo by Hal Fullerton. Courtesy of the Queens Borough Public Library, Long Island Division, Hal B. Fullerton Collection. While the LIRR ferried passengers across the East River to Manhattan, the Pennsylvania Railroad ferried passengers from the West across the Hudson River to Manhattan. For reasons analogous to those recognized by Baldwin, the Pennsylvania Railroad (PRR) was making plans to build an all rail route to reach Manhattan from the West. Unlike the LIRR, the PRR was one of the nation’s largest railroad syndicates and consequently had the financial resources to launch such a large undertaking. However, permission to build rail lines and a terminal in the borough of Manhattan had been granted to the LIRR, not the PRR. In 1900, Baldwin and the PRR finalized an agreement by which the Pennsylvania Railroad would purchase the LIRR for $6 million provided that it would build a terminal in Manhattan and ralroad tunnels under the East River. Under this arrangement, both railroads (which remained operationally distinct until 1928) would be able to operate direct rail service to Manhattan. To accommodate the rapidly rising population of new commuters, construction companies built homes at an unprecedented pace. Home construction reached a fever pitch as contractors rushed to build “suburban homes for all business men who wish them.” In Malverne for example, the Amsterdam Development and Sales Company began constructing homes in 1912. By 1920, over 100 homes had been built on land that had been used for agriculture just ten years earlier. Elsewhere on Long Island, real estate companies such as the Hewlett Land Improvement Company, the Freeport Land Company, Garden City Development Company, and the Bellmore Land Improvement Company developed residential communities aimed at the average middle -class family. 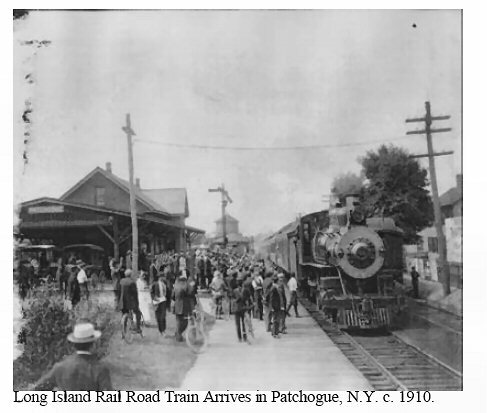 In yet another illustration of the railroad’s importance to the suburbanization of Long Island, these companies chartered trains to transport potential buyers to home sites under construction. As Edward Smits, author of Nassau, Suburbia, U.S.A., writes: A definite change in Nassau’s population was evident. Stimulated by railroad promotion of the area as both a resort and a year-round home, its growth was increasingly steady. Along both shores attractive communities were developing for middle-class businessmen from the city, where their families could live in a healthy semi -rural environment. materials of this period reveal a struggling railroad seeking to entice people to come to Long Island in any way possible. The railroad’s promotional team, led by Special Agent Fullerton, launched several different visions of Long Island that it hoped would appeal to middle and upper-class New Yorkers. From 1900-1930, Long Island was simultaneously promoted as an ideal vacation destination, a recreational paradise, an ideal home for commuters, and a fertile land for agricultural pursuits. The Passenger Department saw these vastly different images as not only compatible but mutually reinforcing. 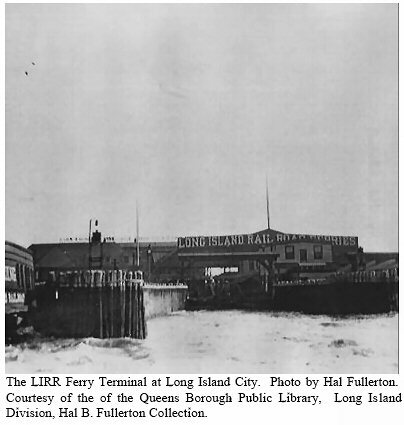 With its vast publication efforts, the LIRR had been the central author of a new vision of Long Island – a winning combination of the recreational and the residential – the Sunrise Homeland. It would undoubtedly be influenced and modified later on, but the basic structure had been laid out. The Sunrise Homeland signified a home of leisure that was solid, close to New York City, conducive to family life, and fun. Long Island in 1930 was already a well-known suburb of a great metropolis. Later waves of migration eastward would merely confirm that identity. 1 Geoffrey L. Rossano, “Broader Networks of Modernization,” in Between Ocean and Empire: An Illustrated History of Long Island, ed. Robert B. Mackay, Geoffrey L. Rossano, and Carol A. Traynor, (Northridge, CA: Windsor Publications, 1985), 160; Natalie A. Naylor, “Population Statistics” in The Roots and Heritage of Hempstead Town, ed. Natalie Naylor, (Interlaken, NY: Heart of the Lakes Publishing, 1994), 226. 2 Ralph Henry Gabriel, The Evolution of Long Island: A Story of Land and Sea (New Haven: Yale University Press, 1921), 132; E.B. Hinsdale, History of the Long Island Railroad Company, 1834-1898 (New York: The Evening Post Job Printing House, 1898), 4; The official name of the railroad is the Long Island Rail Road. However, when referred to as a corporate entity, it is the Long Island Railroad Company; Jacqueline Overton, Long Island’s Story (Garden City, NY: Doubleday Doran & Company, 1929), 230; Gabriel, 133; Hinsdale, 5. See also Mildred H. Smith, Early History of the Long Island Railroad, 1834-1900 (Uniondale: Salisbury Printers, 1958). 3 Ron Ziel and George H. Foster, Steel Rails to the Sunrise (New York: Hawthorn Books, 1965), 11; Hinsdale, 5. 4 For more on Poppenhusen see James E. Haas, “Conrad Poppenhusen: A Biographical Sketch of the `Benefactor of College Point’ Emphasizing the Civil War Years,” Long Island Historical Journal 16 (Fall 2003/Spring 2004): 135-144. 5 Ziel and Foster, 13; Gabriel, 142. 6 Edward J. Smits, Nassau Suburbia, U.S.A.: 1899 to 1974 (Garden City, NY: Doubleday & Company Inc., 1974), 118. 7 Robert B. MacKay, “Of Grand Hotels, Great Estates, Polo, and Princes” in Between Ocean and Empire, 112-131, 112; Ziel and Foster, 38-39. 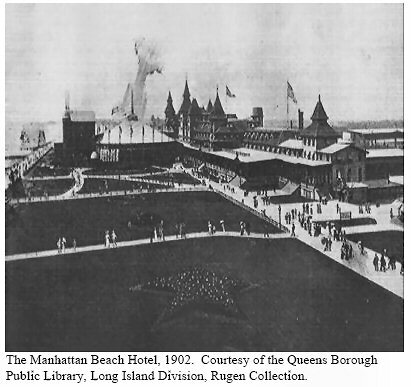 The Manhattan Beach Hotel and the Oriental Hotel were in Coney Island. The Argyle Hotel was in Babylon. The second edition of the book in which Robert MacKay’s article appeared was entitled: Long Island: An Illustrated History, ed. Robert B. MacKay and Richard F. Welch (Sun Valley, CA: American Historical Press, 2000). 8 MacKay, 114; Howard M. Smith, Long Island Illustrated (New York: The Long Island Rail Road Company, 1903), 5. 9 Smith, Long Island Illustrated, 106; MacKay 112. 10 Annual Report of the Long Island Rail Road Company for the Fiscal Year Ending June 30, 1895 (Long Island City, NY: Long Island Railroad Company, 1895), 18; (This pamphlet and many of the other sources cited in this article can be found in the Nassau County Museum Collection of the Long Island Studies Institute, Hofstra University); Vincent F. Seyfried, The Long Island Rail Road: A Comprehensive History: The Age of Expansion 3 (Garden City, NY: self-published, 1961-1984), 159; MacKay, 114. R. Gelwicks Co. Inc, 1928), 1. 12 Smith, Long Island Illustrated, 5; Suburban Long Island, “The Sunrise Homeland” (New York: Long Island Railroad Company and the Long Island Real Estate Board, 1921), cover page. 13 Natalie A. Naylor, Professor Emeritus of History, Hofstra University, interview by author, March 26, 2004, Hempstead, NY. 10,000 copies of Cyclists’ Paradise were printed for its first issue in 1897 and it went through two additional issues. In addition, The Agronomist had 16,000 subscribers. 14 Charles L. Sachs, The Blessed Isle: Hal B. Fullerton and His Image of Long Island 1897-1927 (Interlaken, NY: Heart of the Lakes Publishing, 1991), 36. 15 Smits, 161; Campaign of Education, 4; Long Island, America’s Sunrise Land (New York: Long Island Railroad Company, 1926), cover page; Campaign of Education, 4; Long Island, America’s Sunrise Land (New York: Long Island Ra ilroad, 1930), 7. 16 Sachs, 24, 29, 32 and 36; Gabriel, 181; Gabriel, 181. 17 Sachs, 37 and 38. 18 Smits, 12; Eugene L. Armbruster, Long Island, Its Early Days and Development (New York: The Brooklyn Daily Eagle, 1914), 43; MacKay, 119, 127; Ketcham, 36. 19 Long Island Illustrated, (New York: Long Island Railroad Company, 1900), 7. This pamphlet from 1900 will be cited as Long Island Illustrated while Howard Smith’s 1903 pamphlet of the same title will continue to be cited as Smith, Long Island Illustrated, followed by the appropriate page number; Kenneth T. Jackson, Crabgrass Frontier: The Suburbanization of the United States (New York: Oxford University Press, 1985), 98; MacKay, 121. 20 Long Island Illustrated, 6; Long Island, America’s Sunris e Land (1930), 15; MacKay, 119; Forest Hills hosted the U.S. Men’s Championship, later known as the U.S. Open, from 1923-1978. It hosted the U.S. Women’s Championship from 1935-1978. 21 MacKay, 119; Long Island, America’s Sunrise Land (1930), 15; MacKay, 120, 121. 22 Smith, Long Island Illustrated, 7; “Development of LI,” South Side Messenger, February 23, 1911; Edith Loring Fullerton, The Lure of the Land, A Call to Long Island: The Story of the Work of the Long Island Railroad Company at Experimental Station Number One (New York: The Long Island Railroad Company, 1906), 8. 23 MacKay, 119; Smits, 12. 25 Ketcham, 36;Sachs, 35; Long Island Illustrated, 5. 26 Long Island Illustrated, 4; Smits, 4. 27 “LIRR Celebrates 150 Years of Service to Long Island,” Along the Tracks, 9 (New York: Long Island Rail Road, 1984); Ron Ziel, LIRR historian and co-author of Steel Rails to the Sunrise, interview by author, December 4, 2003, Southampton, NY. 28 “El” is short for elevated, because the tracks were raised above street level. 29 Ziel and Foster, 41. 30 Austin Corbin, Quick Transit Between New York and London (New York: self-published, 1895), 31. 31 A Brief History of the Long Island Rail Road, 69; Ziel and Foster, 75, 184; “Long Island Rail Road’s Checkered Career,” Brooklyn Daily Eagle , June 8, 1901. 32 Correspondence Between the President and General Manager of the Long Island Rail Road and the Board of Estimate and Apportionment of the City of New York in Relation to Grade Crossing Matters and Improvements in Queens Borough (New York: The Long Island Railroad Company, n.d.), 17; Ziel and Foster, 190. District: An Address Delivered at the Second Annual Meeting, Long Island Chamber of Commerce (New York: Long Island Chamber of Commerce, 1928), 3. (Long Island City, NY: Harry R. Gelwicks Co. Inc., 1928), 1; Statistical Railroad Summary, 1923-1929 (New York: Committee on Public Relations of the Eastern Railroads, 1929); Sachs, 66; Armbruster, 43. There were not many motor vehicles on Long Island prior to World War I. In 1915, there were only 8,766 automobiles in Nassau County for a population of 116,825 – hardly a common possession. During the 1920s, car ownership became fairly common among Long Island families. 35 “Development of LI,” South Side Messenger, February 24, 1911; Rossano, 176; “LIRR Celebrates 150 Years of Service to Long Island,” 13. 36 The phrase may have also been an allusion to the all night parties of the Jay Gatsby-type millionaires who made their homes on Long Island; What Poets Say About Long Island, The Land of the Sunrise Trails (New York: The Long Island Railroad Company, 1923), 18. 37 Ziel and Foster, 49; Smits, 10; Long Island and Real Life (New York: The Long Island Railroad Company, 1916), 7.